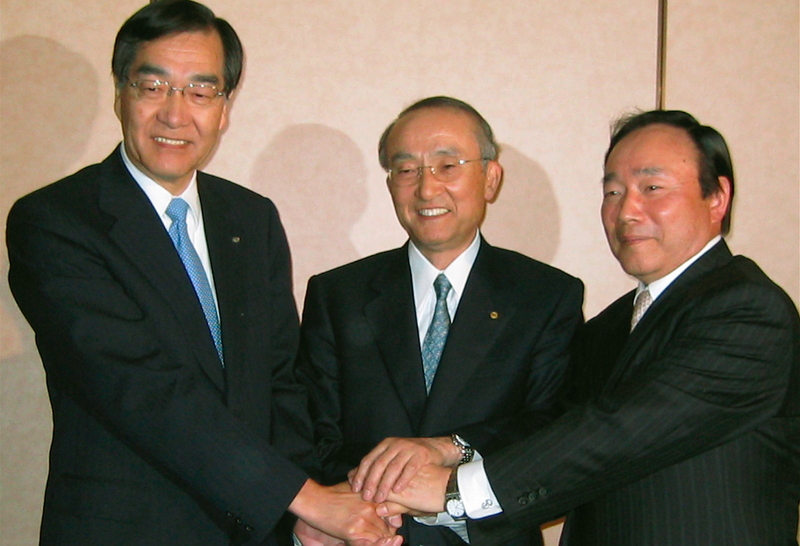 Toyota President (center), Fuji Heavy Industries President (left) and Daihatsu Motor Co. President (right) agreed on joint ventures in 2008. The Japanese auto industry is crowded. Too crowded, according to Bloomberg’s industry expert, who thinks Japan’s seven automakers will have to merge into three or fewer groups in the next four years to keep up with rising development costs. Last month, Toyota went from owning a majority stake in Daihatsu to owning the company entirely after a $3 billion sale. That move, according to Bloomberg’s source Takaki Nakanishi, an analyst at Jeffries Group LLC investment banking firm, marks beginning of a trend towards consolidation in Japan. In the next four years, Nakanishi thinks Japan’s seven remaining automakers—Toyota, Honda, Suzuki, Nissan, Fuji Heavy Industries, Mazda and Mitsubishi Motors— will merge into no more than three consolidated companies. To have one or two carmakers in a country is not only natural, but also helpful to their competitiveness...Japan has just too many and the resources have been too spread out. It’s a natural trend to consolidate and reduce some of the wasted resources. Scale has become essential to competitiveness, so you need to consolidate...It makes sense to put everything together, because this enhances competitiveness. Nakanishi isn’t the only one saying this. That quote above sounds a lot like it came straight from the mouth of Fiat Chrysler’s overlord, Sergio Marchionne. He’s been going on and on about consolidating for months now, saying that the cost of investing in emerging fuel economy technology is going to make it hard to make money without more joint partnerships or mergers. So there’s a good chance heavy consolidation is on the horizon, but what will that do to consumer choice? Honestly, most consumers probably aren’t going to care or even notice if the same platform sits under a Toyota and a Mazda, particularly if the car is a small sedan or CUV. Do people notice the difference now between a Nissan Altima and a Toyota Camry platform? I’d argue that many don’t. So many components are shared between vehicles anyway, and with competitive benchmarking in full force, cars are cheating off eachother anyway. Plus, if you look at Japan’s home market, where a large percentage of sales are inexpensive, small Kei cars—cars that are barely visually distinguishable, much less platform-distinguisable— consolidation starts to make even more sense. So it looks like consolidation is already underway. Whether that leads Japan’s seven groups to become only three in the next four years remains to be seen, but with all the new technology on the horizon and Apple and Google getting into the mix, I wouldn’t be surprised.